The American League's 7-time all-star shortstop and 1930 MVP played with the Pittsburgh Pirates (1926-27), Washington Senators (1928-34) and Boston Red Sox (1935-45); 2-time A.L. president (1959-74); elected to the Baseball Hall of Fame in 1956. PS, 6" X 3½ unlined heavy stock card, n.p., n.y. Fine. A larger and bold later life signature in blue ballpoint at upper left; right side of card has glossy color 2¼" X 2 3/4" reproduction of an early baseball card featuring Cronin in Washington Senators uniform half-length clutching a bat (thus dating this facsimile at early 1930s). This English soccer defender played for a wide range of teams, first in the U.K. but mostly in the U.S., starting with Queens Park Rangers in 1977 and ending with Tulsa Roughnecks in 1996. Bold "To Richard / Best Wishes / Barry Wallace / #3" in black ballpoint on a special heavy stock 5" X 3" card, dated by him "25th August 1980" at upper right. Fine. With original envelope (postally cancelled Tulsa, Oklahoma). A prime example from Wallace's first year playing in the U.S. This German midfielder played eleven seasons with Werder Bremen. Color PS, 2" X 3", n.p., n.y. Fine. Color head-and-shoulders portrait in uniform, signed boldly in blue ballpoint across green jersey. Undated, but printed text on verso notes 1979. A sharp early example. This English soccer star spent most of his professional playing a variety of positions for Leeds United (1963-80). A bold and handsome signature and "Leeds United A.F.C." in blue ballpoint on a special heavy stock 5" X 3" card, dated by him "13th March 1979" at upper right. Fine. with original envelope. Nicknamed "The Cat," this left-hander pitched for the St. Louis Cardinals from his debut in 1940 until 1952, playing twice in the World Series, then played one season with the St. Louis Browns. Large bold signature in black ink on a lined 5" X 3" card, n.p., n.y. Very good. Faintly age toned, else a strong example. This left-handed pitcher debuted with the New York Yankees in 1930, remaining there until 1942; among many career highlights, he played in five World Series and seven All-Star games, and in 1972 was inducted into the Baseball Hall of Fame. Bold signature in bright red fineline on a heavy stock 5" X 3" card, at left (naturally) of which is tipped a 2¼" X 3" color glossy reproduction of a 1933 Gomez baseball card (overall total dimensions thus 7" X 3"). Undated, but later life (circa 1975). Fine. A fun presentation. This Canadian hockey star played centre for the NHL for 15 seasons, including the Philadelphia Flyers, Washington Capitals, St. Louis Blue and Toron to Malpe Leafs, before death at age 44 of cancer. Large bold signature and "#9" (his St. Louis Blues jersey number) on a heavy stock 5½" X 3½" card, n.p., n.y. Very good. Faint age toning. With original envelope, cancelled in St. Louis, Missouri on 17 April 1989. This American college hockey star joined the 1960 Winter Olympics team, the first American team to ever win gold; in 1981 he was inducted into the U.S. Hockey Hall of Fame. Bold signature in blue fineline on a special heavy stock 5" X 3" card, n.p., dated in another hand 22 October 1984. Fine. Accompanied by an unsigned high quality 4" X 5" black-and-white portrait of Cleary in later years in suit and tie. Original envelope present. The Denver Broncos new head coach in 1962 was named AFL Coach of the Year, but he only lasted there until 1964, after which he is best known for acting as the Los Angeles Rams as scout, defensive line coach, assistant general manager and other posts. IPS, 5" X 7", n.p., 2 April 1980. Near fine. 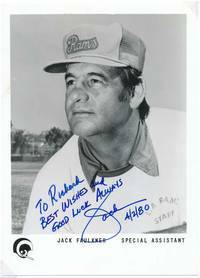 Attractive black and white glossy head-and-shoulders pose in Rams cap and staff shirt, handsomely inscribed and signed in a light area near center: "To Richard / Best Wishes and / Good Luck Always / Jack / 4/2/80." 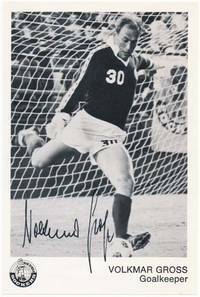 This German goalkeeper played soccer for Hertha BSC (1967-72) and others in Germany and South Africa before finishing his career in the U.S. with the Minnesota Kicks (1979) and San Diego Sockers (1979-83). PS, 3½" X 5½", n.p., n.y. Fine. Thin stock printed photograph showing Gross in San Diego Sockers uniform about to kick the ball, signed large and bold in black ballpoint in a light area. Fine. With original envelope (postal cancellation 14 August 1979). This English centre-forward and later fullback played soccer for Norwich City (1946-63), later managing that same team (1962-66) and others. Bold attractive signature in blue ballpoint on a 5½" X 3½" slip bearing "Scunthorpe United Football Club Ltd.," their Scunthorpe address and "With Compliments" in red ink. Fine. Undated, but pencilled on verso is 26 September 1978; Ashman managed this team from 1967-73 and again from 1976-81. A handsome example. 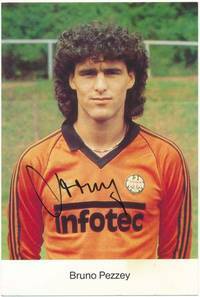 Austrian soccer star considered one of the greatest defenders ever, which he did for Wacker Innsbruck (1974-78), Eintracht Frankfurt (1978-83) and other teams before dying suddenly of heart failure at age 39. Color PS, 4" X 6", n.p., n.y. Fine. Half-length informal portrait as an Eintracht Frankfurt player, signed bold and sloppy across his jersey in black fineline. With original envelope, cancelled in Frankfurt, Germany on 14 September 1982. A superb example signed at the height of his fame. Uncommon. A distinguished World War Two career as a paratrooper with the German Luftwaffe earned him an Iron Cross, but as a soccer goalkeeper he starred for Manchester City (1949-64) and other British teams, later managing a half dozen teams around the world from the 1960s into the 1980s. Bold and handsome "To Richard / Best Wishes / Bernd Trautmann" in blue ballpoint on a special heavy stock 5" X 3" card, n.p., dated by him 3 April 1981. Fine. With original envelope. Long before Charles Atlas, Jack LaLanne, Arnold Schwarzenegger and Richard Simmons there was this household-name eccentric physical fitness advocate who built a business empire around it, founding the magazine "Physical Culture" in 1899 that grew into a magazine publishing behemoth. A big, bold signature in black ink as manly as MacFadden, heavy stock 5" X 3" card, n.p., n.y. Near fine. Though undated, likely of 1930s vintage. Very uncommon. This English forward played soccer for the Wolverhampton Wanderers (1944-57) and Stoke City (1957-61) as well as appearing often for the England national team. Bold, neat "With Best Wishes / Dennis Wilshaw" in blue ballpoint on a special heavy stock 5" X 3" card, n.p., dated by him 26 February 1982. Near fine. With original envelope. This Scottish defender played for Heart of Midlothian (1967-68), then on to England and Manchester City (1968-72), Notts County (1972-79) and others. Bold signature in blue ballpoint, special heavy stock 5" X 3" card, n.p., dated by him 24 March 1980. Fine. With original envelope. This University of Rhode Island point guard achieved basketball immortality at Madison Square Garden in 1946 with "the shot heard round the world" when he made a 62-foot midcourt basket in the final seconds of the National Invitation Tournament against Bowling Green and secured the win for his team, 82-79; he went on to play guard for the Providence Steamrollers (1946-49). Bold signature in blue ballpoint on a heavy stock special 5" X 3" card, dated by him 25 January 1977. Fine. With original envelope. This NFL offensive tackle played for the Los Angeles Rams (1960-63), Dallas Cowboys (1964-67), New Orleans Saints (1968), Detroit Lions (1969) and Washington Redskins (1969). IPS, 5½" X 6½", n.p., n.y. Very good. Would be fine but for faint horizontal crease at center. Printed photograph showing a fearsome Boeke full-length during his Dallas Cowboys years, signed and inscribed by him large and bold in blue ballpoint in a blank area at upper left: "To Richard, / Best of Luck / Jim Boeke." A nice example. New York: Thomas Dunne Books, 2003. Hardcover. Small 4to. Burgundy paper over boards with gilt spine lettering, pictorial dust jacket. xiv, 304pp. Illustrations. Fine/fine. 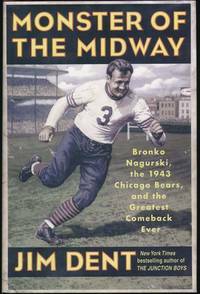 A tight, superb and pristine first edition of this tale of the legendary Chicago Bears fullback and Hall of Famer (1908-90) -- with a fine twist: This copy has six matching, special heavy stock 5" X 3" cards tipped to the front flyleaf (both sides), each signed and dated by a different teammate of Nagurski's from the famed 1943 team. As follows: DAN FORTUNATO (1916-95), offensive lineman, Pro Football Hall of Famer (blue ballpoint, dated 1977 March 27; SID LUCKMAN (1916-98), five-time all-pro quarterback, Pro Football Hall of Famer (blue fineline, dated 1985 March 27); "BULLET BILL" OSMANSKI (1915-96), fullback, College Football Hall of Famer (black ballpoint, dated 1973 December 7); HAMPTON POOL (1915-2000), defensive end (black fineline, dated 1974 April 2); JOHN W. SIEGAL (1918-2015), defensive end (black ballpoint, dated 1978 October 11, adds "Chicago Bears 1939-1943"); "BULLDOG" TURNER (1919-98), center and linebacker (blue ballpoint, dated 1973 November 27). All are bold and fine; Siegal rates very good, with minor abrasion at upper right. The original mailing envelopes for all six are housed in archival sleeve at rear. A wonderful assemblage. This powerhouse third baseman deputed with the St. Louis Browns in 1934, playing there until 1943, when he switched to the Washington Senators (until 1945). Bold and handsome full signature in blue ballpoint, heavy stock 5" X 3" card, n.p., dated by him 1975 March 27. Fine. With original envelope, signed again by Clift at upper left with full Yakima, Washington mailing address in his hand.